Published: April 14, 2014 at 10:12 p.m. Updated: April 17, 2014 at 03:20 p.m.
Do you want a good guess at what Jim Harbaugh's offseason has been like? Back in 2006, Lewis was in his fourth year as the Cincinnati Bengals' head coach, still relatively early in the turnaround that transformed the laughable "Bungles" into the steady playoff contenders of today. But that year, the team's fortunes were still unpredictable, off the field as well as on it. And that is why Lewis, in a conversation we had that December, explained his hate for the word "situation." That is the word he heard far too often, usually in late-night phone calls from the team's security department, as one player after another was arrested, conjuring comparisons to the Mean Machine, the prison-yard team of convicts from "The Longest Yard." "We have a situation," was how the conversation would begin. To which, Lewis explained, he would usually reply with something like, "What did we do now?" There is an important caveat to that story. The Bengals had won four games in a row to get to 8-5 when Lewis and I spoke for a story in The New York Times, and they were leading the AFC's wild-card race. 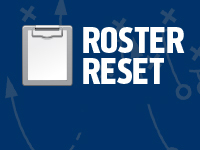 At that point in mid-December, they'd also had eight players arrested since the previous offseason. Coincidentally or not, they lost the last three games of the 2006 campaign to finish 8-8 and miss the playoffs. Which brings us back to Harbaugh and the San Francisco 49ers, who are much further along in their own renaissance -- with three straight NFC Championship Game appearances and one narrow loss in the Super Bowl -- but who lately have undoubtedly heard the word "situation," too. As in "We have a situation involving Chris Culliver." "There is a situation with Colin Kaepernick." And, on Sunday, "Aldon Smith is involved in another situation." The 49ers return for offseason workouts next week, and there is probably no coach more desperate to get his players back under his watch than Harbaugh, who has seen three separate legal encounters of varying degrees of seriousness in the past three weeks. Smith's, on Sunday afternoon, is the most recent and, in some ways, the most troubling, because of the pattern it continues. Smith was arrested at Los Angeles International Airport for making a false bomb threat. Surely there is enough gray area there to warrant caution in judging Smith's innocence or guilt until much more is known. Just as there is in Kaepernick being named as a person involved in an incident report filed in Miami, which also involves other players (including 49ers receiver Quinton Patton). And just as there is in Culliver's alleged hit-and-run, which has led to felony and misdemeanor charges. It is entirely possible that nothing -- or not much of anything substantive -- will come of any of these incidents in a court of law, but with each terse "We are aware of the situation" type of statement from the 49ers, more of their time and attention gets diverted from the more routine and pleasant tasks that go into making football teams successful. 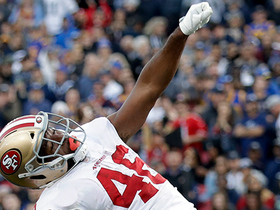 The Niners certainly have been that -- they are, arguably, the second-best team in the NFL, behind only their hated rival in Seattle -- but with each of those pained phone calls they receive, they must grapple with how to manage headaches as well as they have managed opponents. 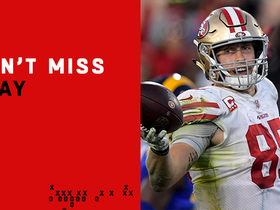 In Smith's case, the 49ers must figure it out soon. They have until May 3 to decide whether to pick up Smith's option for 2015. As a strictly football decision, this is a no-brainer, because if the team does not exercise the option, Smith becomes a free agent after the coming season. Smith is a premier pass rusher and one of the young cornerstones of the franchise that, in a perfect world, the 49ers would like to keep together. Kaepernick, who took to Twitter to vehemently dispute that he was involved in wrongdoing in Miami, is another one of those young commodities, and it is a very bad week when two of your cornerstones are on police radar at the same time. But now, the 49ers have a much bigger, overarching decision to make: What kind of franchise will they be? They have been, with these recent cases, rather hands-off, releasing statements but rarely dirtying their hands with much of anything firmer. Last September, when Smith, who already had a history of serious legal entanglements, was arrested on suspicion of driving under the influence, the team allowed him to play two days later -- a full game, too -- before he entered a rehab facility and missed the next five games. The 49ers were criticized for the propriety of that decision last year, and now, with Smith again in some degree of trouble, it is fair to wonder if what the team claimed was supportive action was merely just the enabling of a troubled -- but talented -- individual. The 49ers certainly wouldn't be the first team to make that choice. Talent, after all, trumps practically everything in sports, as it does in many other businesses, as well. And the NFL is nothing if not a perfect meritocracy. Leeway that is afforded a player of Smith's level is proportionate to his talent, and is far greater than that which the 53rd man on the roster would receive. Plenty of teams have fielded calls about troubled players in the past and dealt with them in the same way: by crossing their fingers and hoping a supportive environment would be enough to steer or scare a player straight. But perhaps it is time for that to change in San Francisco, as much for Smith's own good as for the sake of the reputation and concentration of a team that is prodigiously talented but whose management must be prodigiously distracted by now. Harbaugh's public persona has been that of a slightly off-kilter, obsessive and often brilliant leader. He screams during games, the Sharpie swinging wildly from a lanyard around his neck. He veers into meditations about shipping and sailors and currents during press conferences. Last year, he tweaked the Seahawks about their players who had been involved in performance-enhancing drug use, saying the 49ers wanted to be "above reproach" in everything and do everything by the rules. Harbaugh is getting skewered for that remark now, in part because his biting shot at his opponent has not been matched by blistering remarks about the 49ers players who might not have been above reproach. Maybe Harbaugh, like Lewis before him, is excoriating his players in private, imploring them to behave. 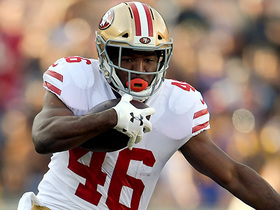 Harbaugh and the 49ers have proven that they are good enough to withstand at least one situation -- they went 5-0 during Smith's rehab-induced absence last year. The Bengals weren't so lucky in 2006, whether or not the string of arrests led to their downfall. And here is an important difference to consider: Cincy's incidents involved mostly peripheral players. Lewis didn't have to field any calls about franchise pillars like Carson Palmer or Willie Anderson then, the way Harbaugh is getting them about Smith and Kaepernick now. The Bengals weren't top-tier Super Bowl contenders in 2006, the way the 49ers have been and likely will be again in 2014, and so the anticipation of San Francisco collapsing under the weight of piling-up police reports might never come to fruition, particularly if Smith, Kaepernick and Culliver don't miss any playing time in the future. 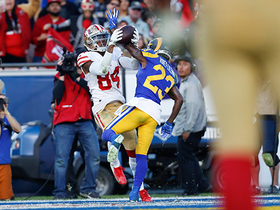 But in the NFL's most competitive division -- with the Super Bowl champions above them in the NFC West and the Arizona Cardinals chasing from close behind -- the 49ers can't afford many more of the sleepless nights their situations bring.